Abstract: The aim of this paper is to present an account of the information we find in various Arabic sources of the early period of Arabic historiography on the preparation of a military naval force and the expeditions launched against Constantinople during the period of the early expansion of the Muslim Arabs. Arabic sources give various pieces of information on shipyards, ports as well the recruitment of local men both in Syria and Egypt in the preparation of a military fleet by the Arab Muslim leaders. The Byzantine naval military bases in Syria and Egypt were taken by the Arabs in the early 7th century, and local men who served the Byzantines before, then joined the Arabs. 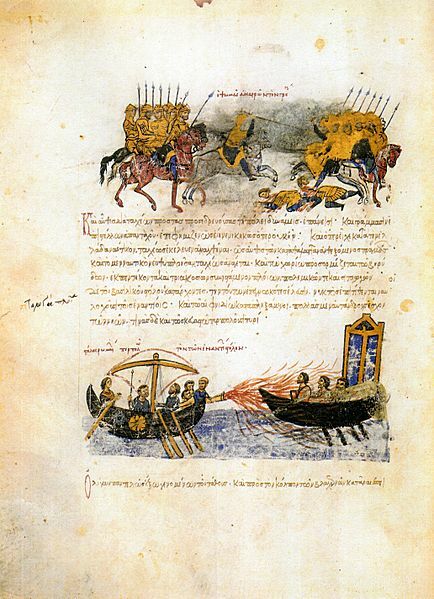 These Arab naval forces were not only engaged in a maritime conflict with the Byzantine fleet in the East Mediterranean but also took part both in the expeditions launched against Byzantine territories and especially in the early sieges of Constantinople, the ultimate aim of all preparations. For the Arabs, the significance of Constantinople was based not only οn its political and cultural prestige but also οn its material affluence. For this reason, four times it was the aim of Arab Muslim forces sent by Arab leaders in Damascus of Syria. Indeed, the Arab navy played an important role in the East Mediterranean conflict and the expeditions against Constantinople, which are celebrated both in Muslim history and legend, have found their way into the Muslim eschatological literature as well. Excerpt: Islam was to challenge Christendom at sea in the Mediterranean for a thousand years. In the early Middle Ages, pace the great naval assaults on Constantinople itself in 673-79 and 717-18, the most serious threat from Islam developed in the ninth and tenth centuries. During that period Muslims were able in some cases to capture and hold, and in other cases to compromise seriously Christian authority over all of the islands and some of the important mainland regions and bases along the trunk routes of the sea. The operations of the Muslim fleets took the form of corsair cruises by single ships or small flotillas, raids on coasts and islands for booty and slaves by ghāzī squadrons pursuing the ghazw of jihād, and full-scale invasions by large fleets. Their ghazw was a form of jihād, perhaps the pre-eminent form, designed and intended to advance the frontiers of the Muslim world, the dār al-Islām, into the world of war, the dār al-Èarb. It does seem, however, that in composition and tactics Muslim flotillas were quite similar to those of their Byzantine opponents. Since much of their activity consisted of raiding, Muslim Mediterranean flotillas of warships included more fast, oared vessels and fewer sailing naves than was the case for their Byzantine naval rivals. But the overall organization of Muslim fleets very much resembled that of Byzantine fleets. Such operations posed extremely serious threats to Byzantine shipping.